Beautifully engraved SPECIMEN certificate from the Florida Humus Company. This historic document was printed by the American Banknote Company in 1922 and has an ornate border around it. In about 1920, Richard Whitney bought the bankrupt Zellwood Farms Company. A five-term president of the New York Stock Exchange, Whitney formed the Alpha Peat Company in 1922 to harvest and sell peat. 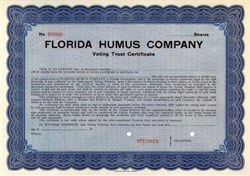 He renamed it the Florida Humus Company in 1925. In 1935, Whitney pleaded guilty to extensive embezzlement and was imprisoned.